Non-European students selected to study at the University of L'Aquila will need to apply for a student visa at the nearest Italian Embassy. The visa application requirements and processing time can be lengthy, taking anywhere from a few weeks up to several months. It is very important that you contact the nearest Italian Embassy for information as early as possible in the application process. When the evaluation process is concluded and the adequate students have been selected, the University of L'Aquila will issue a Confirmation document (invitation letter), which will enable you to apply for a student visa. Submit your application for an Italian visa (you will normally receive an Italian visa valid for one year). Note that you are required to have a passport valid until 3 months after the expiry of your visa. Submit your application for a Declaration of Value (DV) of your Bachelor's degree, which will be required by the Registrar of the University of L’Aquila to finalize your enrolment according to the Italian legislation. A DV is an official document which provides a description of your academic qualification (its legal status, requirements for admission, length, validity, etc.). As the diplomatic authorities may need to check the authenticity of your qualifications or even require them to be legalized, please make sure you begin the required procedures in good time in advance. An invitation letter (in Italian) from the InterMaths Consortium, which states information regarding your admission to our programme and the programme itself, the language of instruction, accommodation, tuition fees, additional grant offered by the InterMaths Consortium (if any) and health insurance coverage. A certified copy of your first cycle university qualification (degree, diploma, title) which can allow access to an Italian MSc Course. A transcript, issued by the competent academic authority, which records all the subject courses/exams included in the curriculum of your 1st cycle of Higher Education qualification. A set of 2 identical passport-size photographs (around 4 cm long x 3.5 cm wide). A certificate giving evidence that you are competent in Italian. 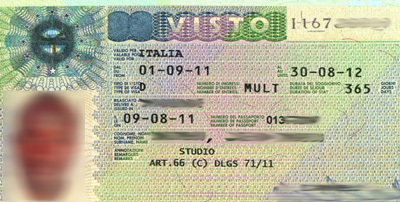 Please be informed that you will receive an Italian visa even without such certificate, as our MSc is entirely taught in English. Finally, note that, before leaving your country to join InterMaths, all you have to worry about is the required documentation required by the Italian authorities. For any other documentation (visa, residence permit, etc) required for your second-year destination (Poland, Ukraine, the Czech Republic), you will have to visit the related embassy/consulate in Rome (Italy) before the end of your first year of study. You'll thus be supported by our staff while you're here. 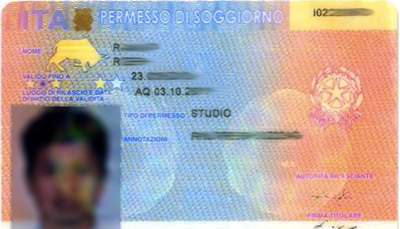 Within 8 days after your arrival in Italy, you will have to apply for a residence permit. Very important note: if you're going to get to Italy several days before our suggested arrival day, please make sure you apply for a residence permit in time. All of these documents will have to be put into an envelope and submitted to the local police station (questura) through a post office. At the end of the submission, the clerk at the post office will hand you three different receipts, which will be your temporary residence permit (keep them safe at home and bring a copy of them with you while travelling). When the police station (questura) has received your application, they'll fix an appointment (usually after around one month) to complete the rest of the required procedures and finally issue the plastic card you can see on the right. The whole process will cost you around 150 euros. Click here to check the status of your application for an Italian residence permit.